Sun.-Thu. 6 a.m.-11 p.m.; Fri.-Sat. 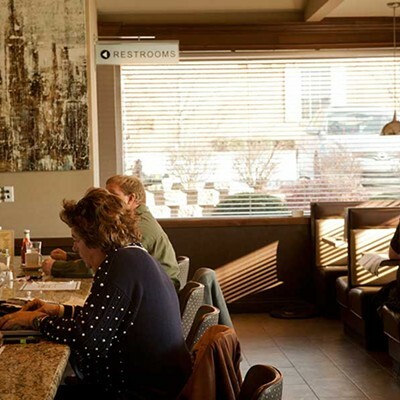 6 a.m.-1 a.m.
Diner traditions differ regionally. 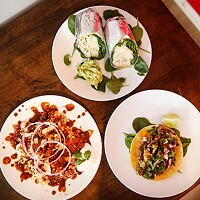 In and around Pittsburgh, "diner" connotes a small, homey place specializing in big American breakfasts and simple, satisfying lunch; hot entrees (if any) are few, it probably closes by mid-afternoon and it certainly doesn't serve alcohol. 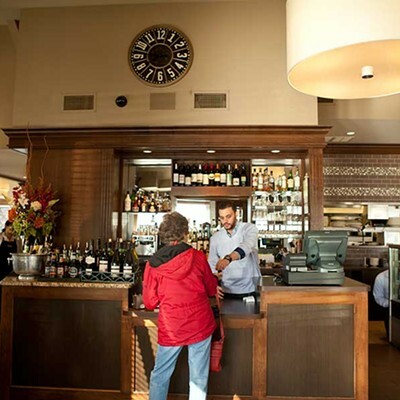 But in metro New York, diners can be counted upon to be open most of the day, if not 24 hours, and they tend to be run by Greeks. 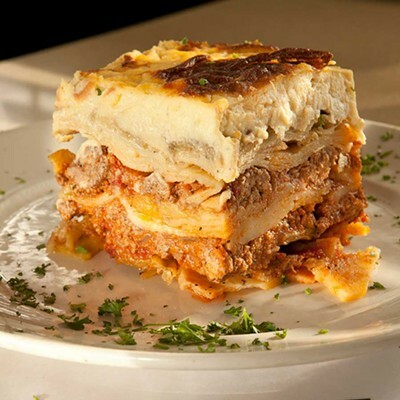 As a result, dinner entrees are numerous, sometimes with elaborate Greek dishes coexisting alongside griddled American fare. 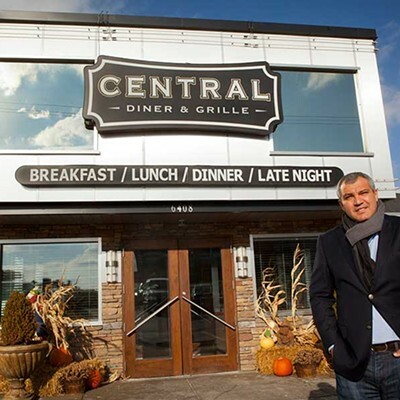 Central Diner, in Robinson, operates in the New York style, in a polished, contemporary building (an overhauled Eat n' Park). 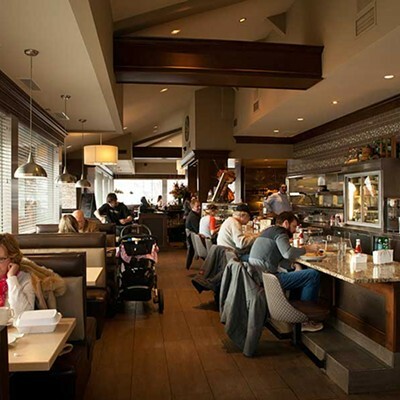 The restaurant is run by husband-and-wife owners Dimitri and Jennifer Takos; Jennifer is Greek-American, while Dimitri is from Sparta via New York City, where he helped run the Kings Plaza Diner in Brooklyn. 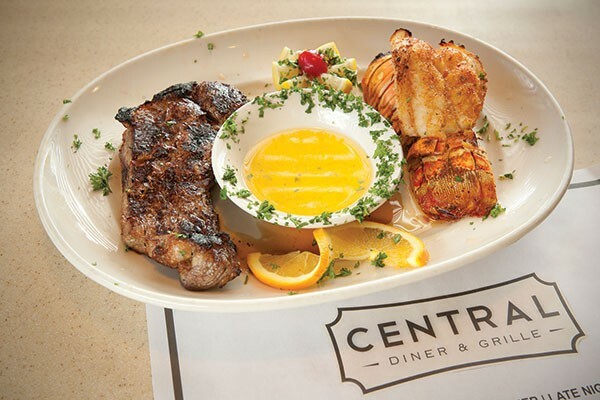 Central isn't open 24 hours, but will sate your hunger during most of the day and night, and its full liquor license suggests a center of gravity rather later in the day than most places slinging eggs and tuna salad. Evidence of Central's commitment to serious cooking was a complete lamb roasting on a spit on the front patio; this is a semi-regular dinner special, yielding 20-odd servings. That said, there were members of our party who prize a diner breakfast above all else, so we visited at midday, the better to straddle the menu's breakfast, lunch and dinner offerings. This meant we didn't get to try such entrée fare as shrimp santorini (broiled with tomatoes and feta) or Roumanian tenderloin steak, but we did sample plentifully from both American diner classics and savory Greek specialties. The dining room, elegantly appointed with dark-stained wood and brushed stainless trim, set our expectations to casual, but high quality. 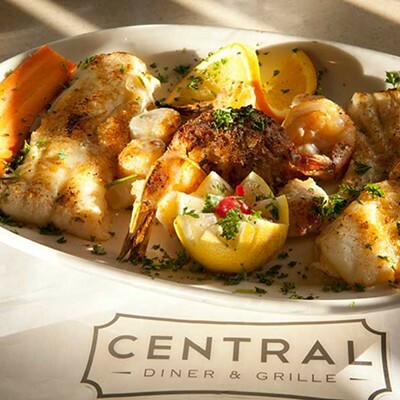 On both counts, Central Diner delivered. 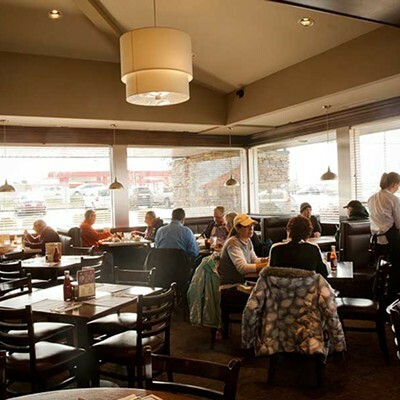 Giant pancakes are a diner staple, but Central's stood out for being deep brown and slightly crisp on one side, paler and more tender on the other side, and fluffy, never soggy, within. Blueberries were plentiful and plump, but their juiciness didn't threaten the integrity of the pancake. The Mediterranean omelet — distinct from Greek and Spanish options (the latter with chorizo) — included spinach, feta and tomato, and managed the balancing act of offering plenty of flavorful filling in an egg envelope which hit that sweet spot between fluffy and firm, moist without being runny. French toast was made with enormous slices of challah — the best choice in our book — in a slightly sweetened egg batter that fried up crisp and light. Just as good were plump sausage links, thick as kielbasa and splendidly juicy, with seasoning that was subtle but absolutely not bland. Pork souvlaki was big, juicy chunks of seasoned grilled pork with peppers, onion and tomatoes served atop a thick, fluffy pita with good, garlicky tzatztiki. Each component of this dish was well prepared, and as the pita soaked up the meat juices, it all came together in an even more satisfying whole. The accompaniment was a rice pilaf that was, improbably, the only disappointment of our meal. It was studded with peas, carrots and celery that had long since given up any flavor, and colored yellow by some spice undeserving of the name. Fortunately, the souvlaki was amply sized to satisfy, and a Greek salad — quite large for a side, and generously filled with Kalamata olives, tomatoes, red onion and feta in a simple, slightly creamy vinaigrette — was excellent. Spanakopita is available as meal or appetizer, and the latter was plenty substantial: a large triangle pleasingly plated with olives, little mounds of shredded carrot and tomatoes. The phyllo crust was deliciously buttery, and dill notes in the filling were distinct without overwhelming the spinach. A stuffed-pepper entrée special confirmed our confidence in the kitchen. Our server's description of it as a green bell pepper (we prefer sweet red or orange) in a "red" sauce (we pictured marinara) gave us pause. 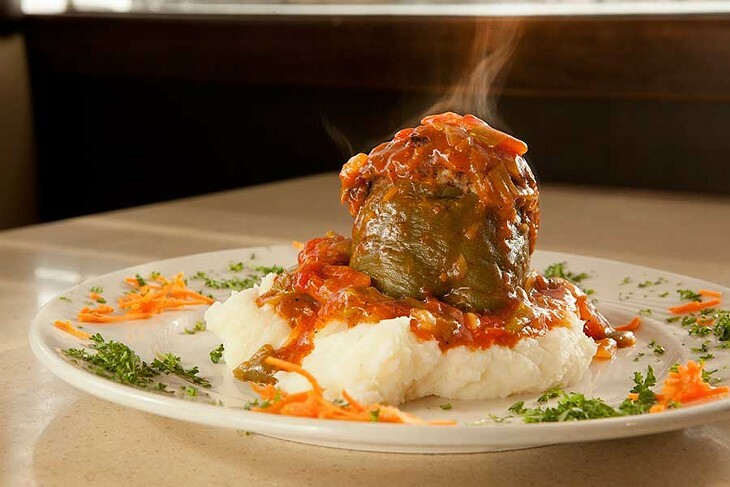 But the pepper was tender and well balanced with its savory filling of ground meat and rice; the "red" sauce turned out to be a delectable vegetable purée studded with whole pieces of carrot and sweet, soft onion; and the whole thing was served on a bed of fluffy, creamy mashed potatoes. This was diner fare at its best: savory, satisfying, and far better than anything we might throw together with such humble ingredients at home. 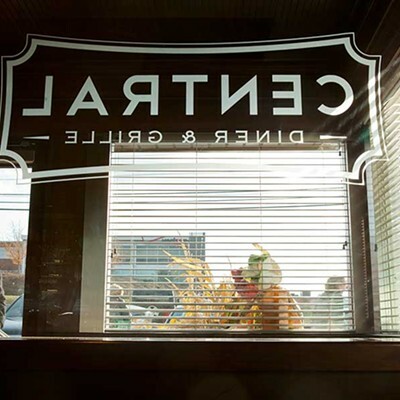 Central Diner goes to show that while a good diner is never fussy, when it takes its food as seriously as more upscale fare, the results can be just as sublime.